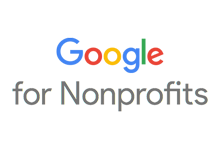 Google Apps for Nonprofits is free and works on any computer or mobile device with a data connection and offline support lets you keep working even when you’re disconnected. Whether you're at your desk, in a meeting, or on a plane, your email is there. Pick an email address that matches your organization's name or web address. 30GB of storage across Gmail and Google Drive means you never have to delete anything, powerful search lets you find everything, and labels and filters help you stay organized.